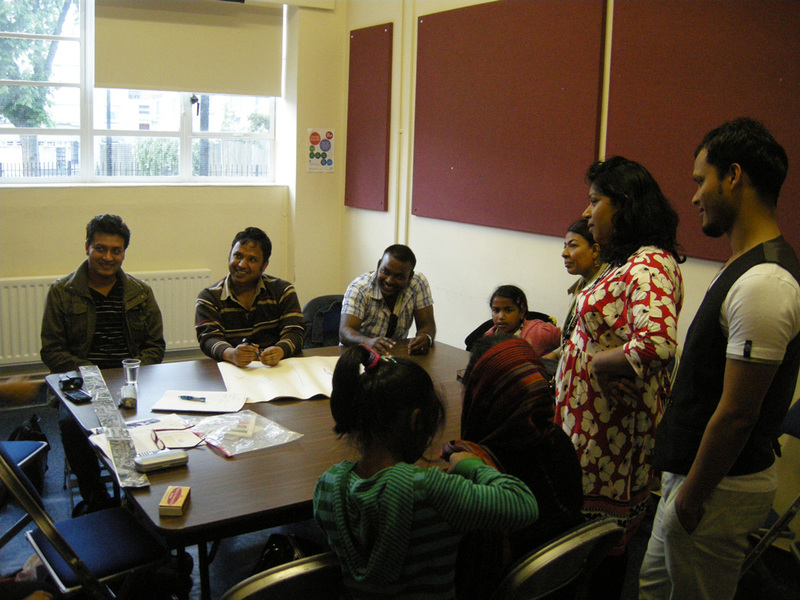 BSK’s second session with Shamin was in a community room by Vallance Gardens. 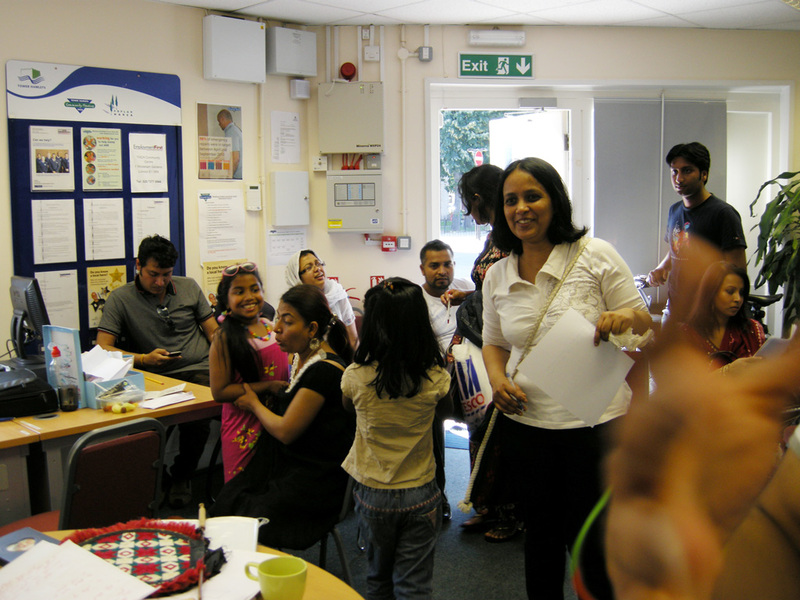 Shamim gave us all a story-telling workshop, using objects as launch-points, then people split into groups to start working on the stories the parents will tell their children for SLICE. We also did some useful practical planning, as we have to start turning this creative process into something specific that will work on screen. And we saw a lovely trial version of a story in a matchbox. We have another session coming soon, so more news then. But, for now, we have some photos to share. 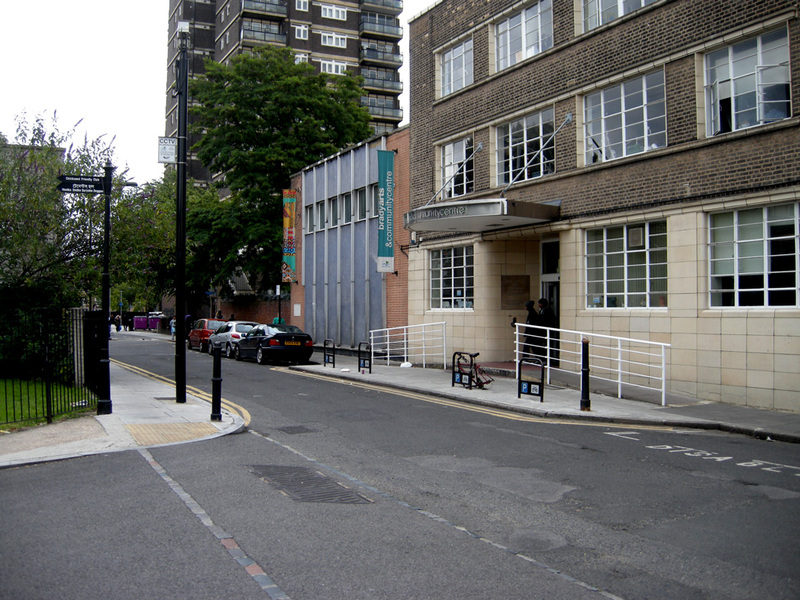 Today I went to a meeting with Shamim and Bishwo Shahitto Kendro (BSK) at the Brady Centre, an East End arts centre through which the slice passes. 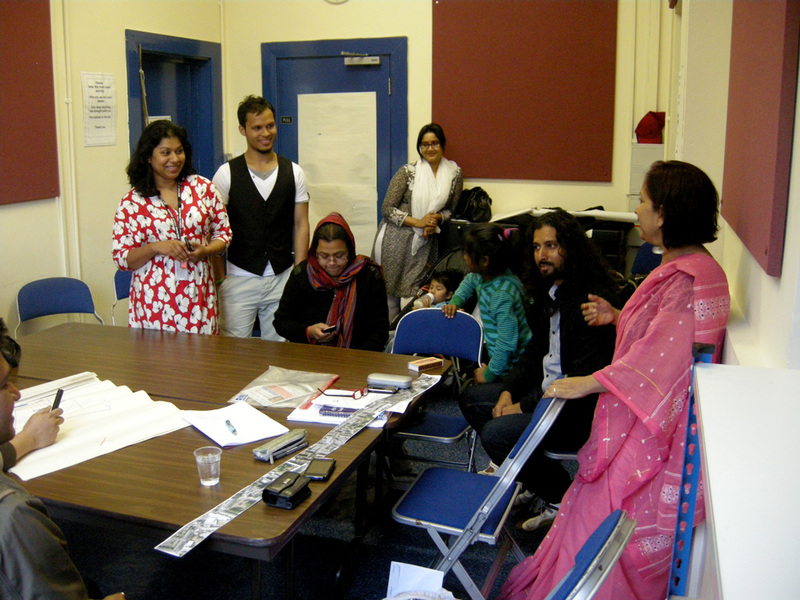 It was very exciting – a grassroots group from the Bangladeshi diaspora engaged with various art forms. 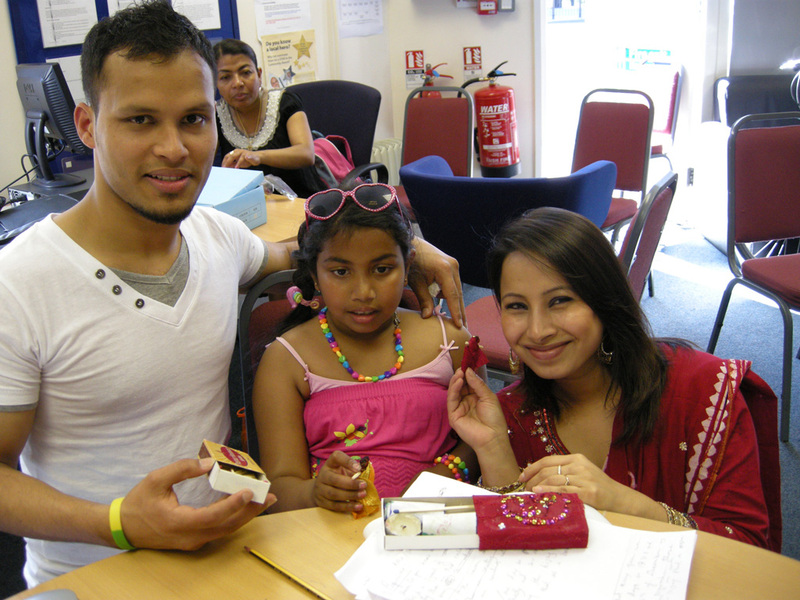 They’re going to work with Shamim and a visual artist called Zaman to explore Shamim’s idea of parents telling their children stories. There were lots of ideas and a great variety of different skills in the room – music, art, drama… We probably could have come up with a whole new slice project. I hope we’ll continue to work with BSK when we come to develop the outreach aspects of the projec. Here are a couple of photos of the group, plus the Brady Centre. 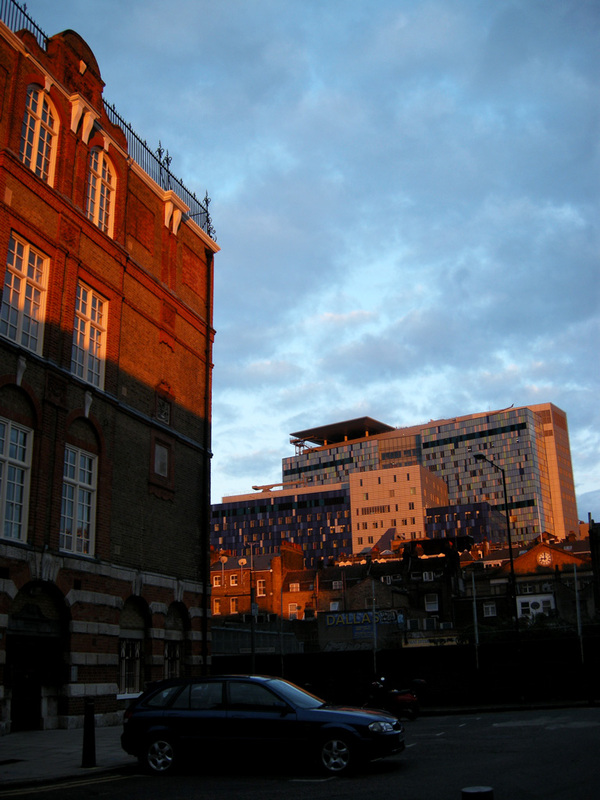 Oh and there was a gorgeous evening light over the eastern end of the slice, so I’m sharing a picture of that as well. Shamim Azad and I walked the London slice the other day. What with sheltering from the rain, stopping off for a delicious lunch and the fact that, in the Brick Lane area Shamim gets recognised every few yards, it took us a couple of hours. Well-spent hours, mind you. It started with what seemed like an auspicious sign for an artwork that will use words: letters, caught in Liverpool Street roof structure, awaiting meaning. The plan, roughly speaking, is for Shamim to work with a group from the community to create something. I’ll then help turn it into a suitable form for the website and installation. One idea is to work with parents to use both visual elements and words to share their experiences of arrival in the area with their children. But it might all change, so I’ll say no more just now! We met a teacher Shamim knows from Christ Church School, which is a lovely old building, right in the heart of Brick Lane. The slice passes right through it. It’d be great to get the kids involved with the project at some stage.